Presenting yourself properly while serving in the military in uniform and civilian clothes requires adhering to strict standards in following uniform regulations, grooming, as well as proper civilian attire. Required: Military Duties. You must wear the Air Force uniform while performing normal military duties. 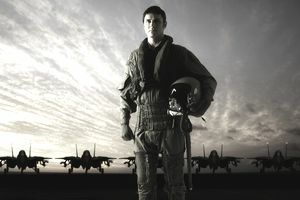 Specific uniforms and uniform items that the Air Force provides free of cost can be required by installation commanders for regular duties, formations, and ceremonies. Authorized optional items may be worn at your own expense, When on travel, you must comply with the uniform policies of that military or civilian installation. Optional: Traveling. You may wear a uniform other than the flight duty uniform when traveling in an official capacity. If you choose to wear civilian clothing during official travel, it must be clean and neat and not too skimpy, such as beachwear. When traveling in foreign countries, you should consult the DoD Foreign Clearance Guide. Do not wear the uniform when attending a public or private meeting or demonstration by a group that is subversive to the government, political in nature, opposes the Armed Forces, or where it implies the Air Force sanctions the cause. You should not wear the uniform when working in a civilian capacity, promoting private businesses, or during political activity. Don't wear military insignia and items with civilian clothes. Hair: The standards call for hair to be clean and neat and able to be covered by the front band of headgear, other than hair in front for women. Dyed hair is only allowed if it is a natural color for the individual. Hair will be clean, well groomed, and neat. Men's hair must be tapered to conform to the natural shape of the head, with or without a block cut. It can't touch the ears and must be closely cut or shaved at the back where it could touch the collar. Men can't wear any foreign items in their hair. Women can wear hair in a bun, straight ponytail or braids in addition to short styles. They can use pins and bands that match their hair color. Wigs and hairpieces must follow the same standards, but cannot be worn in flight operations. Men must have medical documentation of baldness or disfigurement to wear a wig or hairpiece. Beards, Mustaches, and Sideburns (Men): Men cannot wear beards unless for authorized health reasons or special deployment situations. Mustaches are allowed but can't extend beyond the upper lip line. Short, evenly trimmed sideburns are allowed. Cosmetics and Nails: Conservative cosmetics and nail polish are allowed for women only. Nails must be clean and groomed for both men and women and can't interfere with operating safety equipment. Jewelry: Watches and bracelets are allowed but must be of a conservative style and can't be worn if they will be a safety hazard. You are only allowed up to three rings total, counting both hands. You can wear necklaces concealed under your shirt. Women can wear stud earrings. Eyeglasses and Sunglasses: Eyeglasses and sunglasses must not have any ornamentation. Sunglasses can't have mirrored lenses and can't be worn when in formation. You can't wear glasses around your neck. Contact lenses are allowed in natural-looking shapes and designs and cannot be tinted to change your natural eye color. Handheld Electronic Devices: If you wear your cell phone or other devices on your waistband or purse, it must be of a conservative color or in a plain holder of a conservative color (black, silver, dark blue, or gray). You can only wear or use an earpiece or headset unless necessary for performing your official duties or during air travel or doing physical fitness activities. You can't use a cell phone while walking in uniform except for emergencies or to make or receive official notifications. Bags: Attaché cases, gym bags, backpacks, and women's purses and clutches all have specifications to ensure they are conservative and carried in a manner that doesn't interfere with saluting. Religious Apparel: You may only wear religious apparel visibly during religious services. Plain, dark blue or black religious head coverings may be approved by the installation commander to wear indoors or under the uniform/headgear outdoors. The guidelines have details about what is and aren't allowed for tattoos, brands, body piercings and other body modifications. They can't have any objectionable content or bring discredit to the Air Force, whether you are in or out of uniform. A professional military image is required. Tattoos cannot be on the face, head, or hands (other than one wedding ring tattoo). See new AF policy on tattoos. The service dress uniform includes the men's and women's blue service dress coat and trousers or skirt. It is worn with a long sleeved or short sleeved light blue shirt. There is also a maternity service dress jumper and blouse. Men have a tie and women have a tie tab, and a belt is worn. You are required to wear the US lapel insignia, name tag, ribbons, chevrons, and aeronautical badges. Other badges are optional and cufflinks are optional. The service uniform lacks the jacket of the service dress uniform and consists of the light blue long sleeved or short sleeved shirt and trousers or slacks. The tie and tie tab are optional. You are required to wear the name tag, chevrons and aeronautical badges with the service uniform. It is optional to wear ribbons, and you can wear either the regular size or miniature ribbons but can't mix sizes. You can wear a maximum of four earned badges on all blue service uniforms. Aeronautical badges are worn above occupational and miscellaneous badges. Flight Cap: You wear the cap slightly to your right with the vertical crease of the cap in line with the center of your forehead and your nose. It sits about one inch above the eyebrows. When you aren't wearing the cap, tuck it under your belt between the first and second belt loops but don't fold it over the belt. You can wear your service hat instead of the flight cap. Hose (Women): When you wear the skirt, you must wear sheer nylon hose without a pattern in a shade that complements your skin tone. Low Quarters: These are black oxford lace-up shoes with a rounded toe and no perforations or designs. They have a high gloss finish. The heel is no taller than one inch and the sole is no thicker than half of an inch. You wear plain black socks or hose with low quarters. Heels (Women): Women may wear heels with the blue service uniform. They must be plain black without decoration and with a high gloss finish. The heels must be no taller than two and one-half inches and can't have extra thick soles. Combat Boots: You may wear combat boots with the service dress uniform or with the blue service uniform when wearing slacks or trousers, but not when wearing a skirt. The airman battle uniform replaced the battle dress uniform (BDU) and the desert camouflage uniform. You can wear it for "short convenience stops and when eating at restaurants where people wear comparable civilian attire." It's not appropriate to wear it to bars or to restaurants where people wear business attire. It is no longer allowed in Afghanistan by most airmen. Multicam has been approved for Afghanistan however. ABU Coat (Shirt): The long-sleeved button-up coat is made from a nylon and cotton 50/50 blend in a tiger stripe print. You leave the top button unbuttoned but must keep the rest buttoned. Your commander may authorize rolling up the sleeves. You wear a short sleeved or long sleeved t-shirt under it, with the standard color being desert sand. There is a maternity ABU coat as well. You can remove your coat in the immediate work area but must wear it when interacting with customers or clients. Mandatory accouterments include the nametapes, up to four badges, and rank insignia. Hat: The ABU patrol cap, beret, or organizational cap may be worn with the ABU. You must wear headgear outdoors at all times except in designated "no hat" areas. ABU Trousers: These are button-fly 50/50 nylon and cotton blend in the digitized tiger stripe print. You may tuck them into your boots, but whether tucked or not they are evenly bloused over the top of the boot. A desert sand colored web belt is worn. Maternity trousers are also available. Combat Boots: Sage green boots are worn with the ABU. They have rounded toes and may have a perforated seam. Black boots may be authorized for working in some areas that would cause stains to the sage green boot. Laces are tied and tucked into the boot or wrapped around the boot.